Place of Birth: Milton, Massachusetts, U.S.
Place of Death: Houston, Texas, U.S.
George Herbert Walker Bush was an American businessperson and politician. A member of the Republican Party, he served as the 41st President of the United States, from January 20, 1989 to January 20, 1993. He was elected to the position in 1988. He was previously the 43rd Vice President of the United States, from January 20, 1981 to January 20, 1989. He was elected to the position in 1980 and 1984. He was the Republican Party’s nominee for re-election as President of the United States in 1992. He was also a candidate for the Republican Party’s 1980 presidential nomination. President Bush was Time Magazine’s Person of the Year for 1990. He also founded the Points of Light Foundation, to promote volunteerism. He was the longest-living U.S. president. President Bush was the son of Dorothy (Walker) and Prescott Bush (Prescott Sheldon Bush), a politician and banker, who served as a United States Senator from Connecticut, from 1952 to 1963. President Bush was married to Barbara Bush (born Barbara Pierce), until her death. Among their six children are George W. Bush (George Walker Bush), the 43rd President of the United States, and politician Jeb Bush (John Ellis Bush), and among his grandchildren is politician George P. Bush (George Prescott Bush) and journalist Jenna Bush Hager (born Jenna Welch Bush). President Bush’s granddaughter, model and businessperson Lauren Bush, is married to businessperson David Lauren, who is the son of designer Ralph Lauren. President Bush was a devout Episcopalian. Much of President Bush’s ancestry was English, along with small amounts of Scottish, German, Irish, Welsh, Scots-Irish/Northern Irish, Dutch, Swedish, Belgian [Flemish], and French, ancestry. President Bush was also a Member of the U.S. House of Representatives from Texas, from January 3, 1967 to January 3, 1971, the 10th United States Ambassador to the United Nations, from March 1, 1971 to January 18, 1973, the 48th Chairperson of the Republican National Committee, from January 19, 1973 to September 16, 1974, the Chief of the U.S. Liaison Office to the People’s Republic of China, from September 26, 1974 to December 7, 1975, and the 11th Director of Central Intelligence, from January 30, 1976 to January 20, 1977. President Bush and his son were the second father-and-son U.S. president duo, after John Adams and John Quincy Adams. There was also a pair of U.S. Presidents who were grandfather-and-grandson, William Henry Harrison and Benjamin Harrison. President Bush’s paternal grandfather was Samuel Prescott Bush (the son of The Rev. James Smith Bush and Harriet Eleanor Fay). Samuel was born in New Jersey. The Rev. James was an Episcopalian minister, religious writer, and attorney, and was the son of Obadiah Newcomb Bush and Harriet B. Smith. President Bush’s great-grandmother Harriet Fay was the daughter of Samuel Howard Fay and Susan Montfort/Montford Shellman. President Bush’s paternal grandmother was Florence “Flora” Sheldon (the daughter of Robert Emmet Sheldon and Mary Elizabeth Butler). Florence was born in Ohio. Robert was the son of Thomas H. Sheldon and Martha Uncles; Martha’s father was from Bradford, England. Mary was the daughter of Courtland Philip Livingston Butler and Elizabeth Slade Pierce. President Bush’s maternal grandfather was George Herbert Walker (the son of David Davis Walker and Martha Adela Beaky). 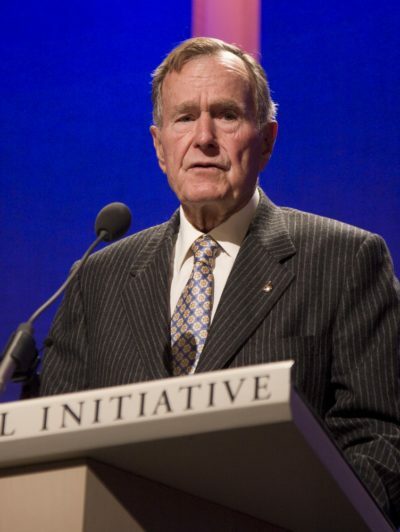 President Bush’s grandfather George was born in Missouri, and was a banker and businessperson. The Walker Cup of golf is named after him. David, a prominent businessperson, co-founded the clothing brand Ely & Walker, and was the son of George E. Walker and Harriet Mercer. Martha was the daughter of Joseph Ambrose Beaky and Mary Anne/Ann Bangs. President Bush’s maternal grandmother was Lucretia “Loulie” Wear (the daughter of James Hutchenson/Hutchinson Wear and Nancy/Nannie Eliza Holliday). Lucretia was born in Missouri. James was the son of William Gault Wear/Weir and Sarah Amanda/Armanda Yancey. Nancy was the daughter of John James Holliday and Lucretia Green Foree. There is a claim on several web sites that one of President Bush’s maternal great-great-great-great-grandfathers, Victor Emanuel Bechi, was Italian. It is not clear if this claim is accurate. Victor Emanuel Bechi is described in one reference book as having come from “Strasburg in the Province of Alsace-Lorraine” (in “Americans of gentle birth and their ancestors,” Volume 1, Hannah Daviess Pittman, Genealogical Pub. Co., 1970). That suggests that Victor Emanuel Bechi may have been of ethnic German origin. The surname Bechi can be Italian. President Bush was a sixth cousin of actress Lily James. President Bush’s paternal great-great-great-great-grandmother, Sarah Horton, was a sister of Lily’s paternal great-great-great-great-grandfather, Stephen Horton. Their parents were Comfort Horton and Joanna Wood. President Bush was also a first cousin, three times removed, of Associate Justice of the Supreme Court David Davis. President Bush’s three times maternal great-grandparents, John Mercer and Rebecca Davis, were also Justice Davis’ maternal grandparents.